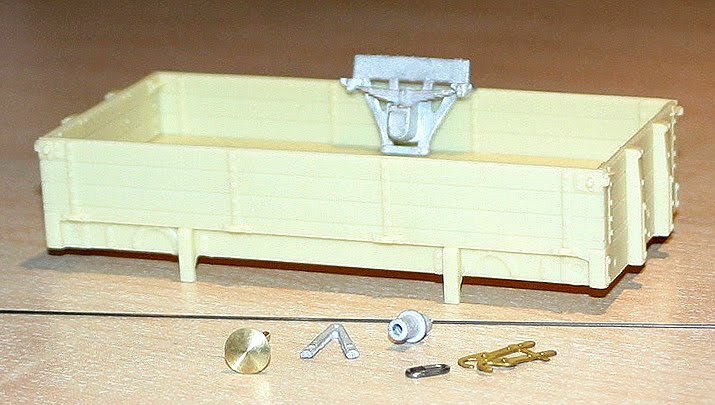 Postie arrived with a little parcel which, when unwrapped, revealed a pair of lovely resin cast GCR 3-plank open wagons to Diag.6, and they will go nicely with the handful of 3 and 5-plank opens I already have from the same source (photo from earlier delivery). These wagons were built from the mid-1890s onwards, but what is particularly useful is that they are virtually identical to the much earlier Diagram 3 and Diagram 4 wagons, so just a little tweaking here and there as earlier diagrams had iron solebar plates and different brakes…nothing too strenuous then. They will probably be given the MS&LR livery, but another nice option is to have one of the Diag.6 wagons running in the Cheshire Lines Committee colours. The MS&LR/GCR has no running powers on Met/Widened Lines Extensions, and no access to the docks or rail-served markets, so these will simply be scattered into various trains rather than run en bloc.